When you are under another person’s auspices, you are being guided and protected by her. When you compromise someone’s safety or reputation, you put it in danger in some way. A fortification is a structure or building that is used in defense against an invading army. An impregnable opinion or feeling is very difficult to change. An indomitable foe cannot be beaten. When a spy infiltrates enemy lines he creeps in or penetrates them so as to gather information. Someone or something that is invulnerable cannot be harmed in any way, and hence is completely safe or secure. To obviate a problem or a need is to eliminate it or do something that makes solving the problem unnecessary. A precarious situation or state is one which can very quickly become dangerous without warning. If you are in a quandary you are in a difficult situation where you have to make a decision but don’t know what to do. We were in real jeopardy or danger when the elephant in the wildlife sanctuary came charging towards our car. We couldn’t believe that the bull elephant was so mad, and that we were in this situation of great jeopardy or threat. Fortunately, throwing our bag of peanuts out the window saved us from being knocked over and trampled, and thus we saved ourselves from great jeopardy or personal hazard. Quiz: Try again! 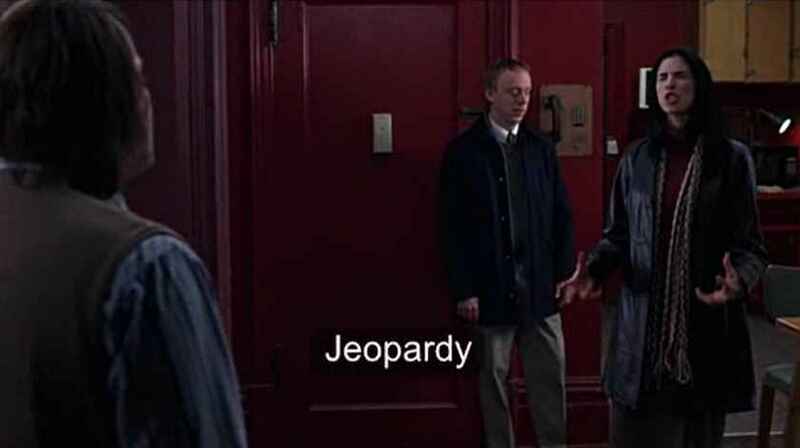 What is jeopardy? It is exposure to great risk of some kind. When you are in jeopardy you are in danger or trouble of some kind. Jeopardy! The Game Jeopardy is a game show where your accumulated money is put into jeopardy when you answer questions. When someone is in jeopardy of losing something, he has a “part (way of) playing” to lose it, and a “part (way of) playing” to retain it, with no way of knowing whether the “joke” will be on him or not! School of Rock Putting Ned's career in jeopardy was a bad idea.